Weighty Matters: The American Heart Association Gets It! A few weeks ago, the American Heart Association released a position paper and call to action on the matter of obesity. The paper, entitled "Population-Based Prevention of Obesity: The Need for Comprehensive Promotion of Healthful Eating, Physical Activity, and Energy Balance" is available online and it details how medical professionals and organizations like the AHA can get involved in the fight against obesity. The paper rightly reports that rather than target the individual, we need to target the environment in an approach akin to the one taken in the fight against tobacco, and that everyone can play a role. "The main point of the statement is that we need to place more emphasis on population-based and preventive approaches than we have to date"
"It's inefficient to put all your eggs in the basket of screening and treating the individual"
"This statement is about putting the information in one place and telling people who don't think it's their business that the level of advocacy and awareness we need also applies to them. We can't afford to have anyone working on cardiovascular disease who, if asked by the person next to them on the golf course or next to them in the hospital, doesn't really get it that obesity is not just a bunch of people who overindulge." "We can't afford to have the people who are involved in treatment think that's the only solution. They also have to convince people to do things that are a lot harder, because they're getting right to the heart of how people live, they're getting into vested interests, and there's not necessarily a profit motive. But cardiologists are very, very authoritative and influential people. People will ask their cardiologist for an opinion, and we want them to know what they should say." I agree wholeheartedly with everything she said and think that the position piece is excellent. So what was my off the cuffness about at the top of this post? 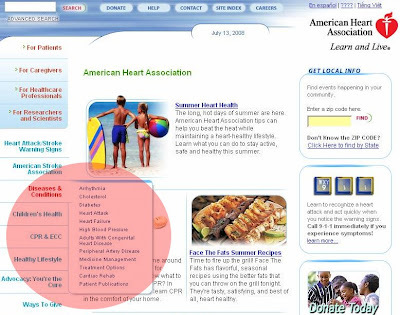 obesity is not listed as a disease or condition important enough to the AHA to highlight on their homepage (click my image above to enlarge). If the AHA really wants their members to get that obesity is not just about individual overindulgence, how about they come right out on their homepage and declare that it's a chronic disease condition and should be treated with the same degree of concern and respect as diabetes, hyperlipidemia and hypertension as a valid target for both treatment and prevention efforts?